"How did I cook without these?!" —You, after reading this post. We asked members of the BuzzFeed Community to tell us their favorite kitchen gadgets. Get ready, because here are the (amazing) answers! 1. A compact air fryer that'll make you say, "Damn, these fries are crispy — I can't believe there's no oil in them!" You can obvs add oil if you prefer, but you don't need it to get crispy results! 2. A garlic twist for getting a perfect mince in a matter of seconds. It'll also keep the smell from getting on your hands. It also works with ginger, olives, chili peppers, onions, herbs, nuts, and more! You can adjust it for coarse to fine mincing. "I got it as a housewarming gift, and it’s so great that I gave a bunch as Christmas presents. No more mincing sticky garlic, and it works for tear-free shallot mincing, too!" —Ellen S.
Get it from Amazon for $17.50 or the Grommet for $19.95 (available in two colors). 3. 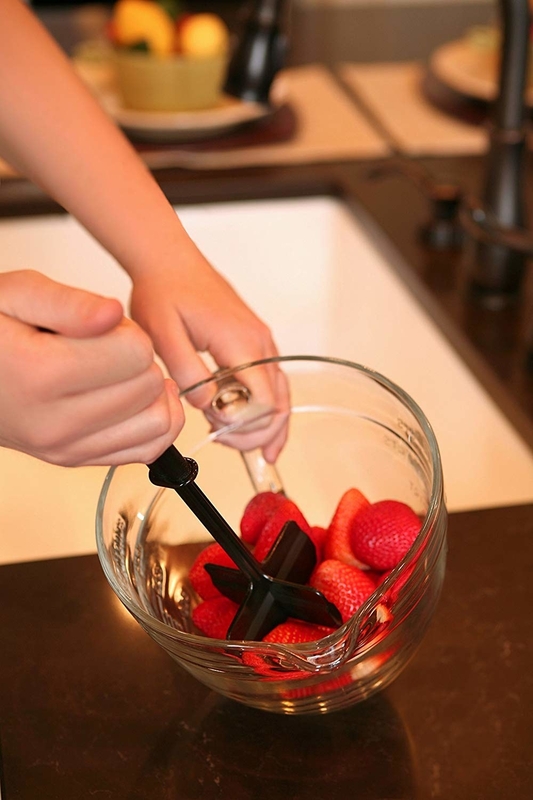 An immersion blender to whip up smoothies, soups, sauces, and batters. Immersion blenders are a great alternative to full-size blenders and mixers for smaller apartments with limited storage and counter space. This one comes with three attachments: a two-cup chopping bowl (so you can use it as a food processor), a whisk attachment, and blender cup that can double as a travel mug. 4. A julienne peeler so you can get thin and uniform strips of veggies for your salads and stir-frys. Get it from Amazon for $17.50. Or, check out a cheaper option. 5. A splurge-worthy chef's knife that'll slice through ingredients like buttah. You know what makes this knife even better? It's dishwasher-safe! Get it from Amazon for $44.95 (also available in other knife styles). The is our cheap pick for the best chef's knife on BuzzFeed Reviews! 6. A surprisingly versatile waffle maker for whipping up your fave brunch foods at home. Think of the money you'll save! "Honestly, when I first got it, I was annoyed at the storage it took up, so I decided I was going to use the hell out of it. I now host monthly waffle bars — I provide the waffle mix and the iron, and guests bring all the toppings (and drinks)! Even though it’s silly, empowering my friends to make their own waffle brings them so much joy and laughter, especially when they add too much mix to the iron! I bring it into work all the time, too." —Sonja C.
7. An ergonomic can opener with cushioned handles and a large turning knob to give you a better grip and smoother cut. This can opener has a magnet that lifts the lids off and ensures that cut lids don’t fall into the cans! Get it from Williams Sonoma or Amazon for $13.95. 8. A manual food chopper because cutting tomatoes and onions with a knife can be a pretty terrible experience. This handy gadget can chop up large pieces of fruit, vegetables, boneless meats, herbs, nuts, and even ice. It gives you full control over the consistency — you can get anything from large chunks to a fine mince depending on how many times you pull it. In addition to cutting up veggies for salads, it can make pesto, hummus, salsa, and guacamole. It also comes with a sealing storage lid to keep ingredients fresh in the container. Get it from Amazon for $15.22+ (available in three colors). 9. A rice cooker that'll be a lot more consistent than simmering rice over the stove — you'll get tasty results every time. This Zojirushi rice cooker has a three-cup capacity. It has settings for pretty much any type of rice — white/sushi, mixed, porridge, sweet, and brown rice. "I always used to worry about under- or over-cooking my rice, but now I can plug my rice cooker in and let it work its magic." —Alyssa O. Get it from Amazon for $129.99. Or, check out a cheaper option. 10. A veggie spiralizer for an easy way to prepare zucchini noodles aka zoodles. This spiral slicer has dual stainless-steel cutting blades for thick or thin pasta strands. It's dishwasher-safe and can be used on zucchini, squash, carrots, and even potatoes! 11. An Instant Pot, which will do just about anything you want it to. It's a pressure cooker, slow cooker, rice cooker, steamer, sauté pan, yogurt maker, and food warmer all rolled into one nifty appliance. 12. A sous vide precision cooker to trick others into thinking you're a culinary whiz. Pretty much anything you throw at it will be done to perfection. Sous vide, which means “under vacuum” in French, refers to the process of vacuum-sealing food in a bag, then cooking it to a very precise temperature in a water bath. This method ensures maximum tenderness and moisture retention — without worry of overcooking. 13. A convection toaster oven that can do anything from heating up leftover pizza to cooking a fancy meal from scratch. A convection heating fan circulates warm air throughout the oven for fast, even baking. Get it from Amazon for $62.13+ (available in two sizes). 14. An electric potato peeler for a satisfying and hands-free way to pare your produce. 15. A 3-in-1 breakfast station to help start your day off on the right foot — or at the very least, on a full stomach. The coffee maker brews up to four cups of coffee at a time, and the toaster oven toasts up to four slices of bread at a time. There's a 30-minute timer with automatic shutoff. The oven tray and non-stick griddle are removable for easy cleaning. "It’s the perfect size for our tiny city apartment and for just the two of us." —Samantha W.
Get it from from Amazon for $64.62. 16. An electric kettle so you won't have to fire up the stove just to brew some tea or enjoy some Cup Noodles. Get it from Amazon for $18.11. 17. A no-fuss Crock-Pot that'll simmer away while you're at work. Just add in ingredients in the morning, turn it on, go about your day, and come home to dinner! This eight-quart Crock-Pot serves up to 10 people. The stoneware and glass lid are dishwasher-safe! 18. An apple divider for getting thin, dippable slices to pack as a snack. Get it from Amazon for $9.22+ (available in two styles). 19. A microwave pasta cooker because even boiling water can seem like a lot after a long day a work. 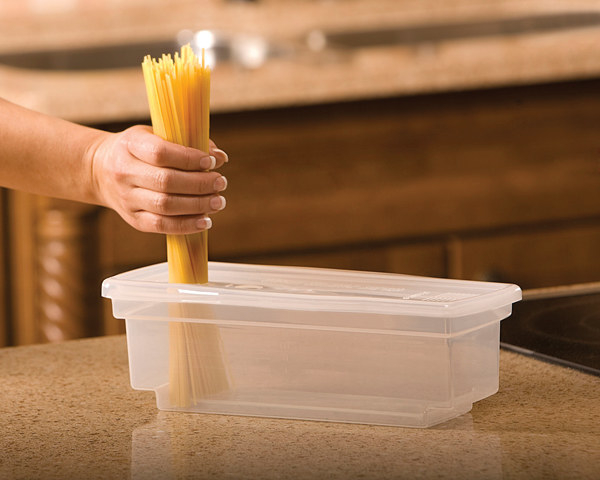 You'll be able to measure, cook, and strain using one container, so there won't be much to clean up afterward! 20. A cake pan with a guideline grid on the edge so you can divide your baked treat into even portions. It's so much ~batter~ than a regular baking tray. This pan also comes with a cutting tool! Get the covered cake pan from Target for $39.99. Or, check out the entire collection at Bed Bath & Beyond. 21. A Ninja kitchen system that can be a full-size blender, personal blender, and food processor all in one. This kitchen system comes with a 1500-watt base, an eight-cup food processor bowl, a 72-ounce pitcher, and two 16-ounce to-go cups with lids. P.S. It also has a 4.4 out of 5 rating and over 1,000 reviews on Amazon! Get it from Amazon for $139.99 or Walmart for $149. 22. A fish spatula with more uses than just turning a filet — it'll easily slide beneath gooey cookies, fried eggs, and more. 23. A manual food chopper for breaking up ground meats, mashing potatoes, or cutting up hard-boiled eggs. This food chopper is made of food-safe nylon and has no sharp edges. It's safe to use with nonstick cookware. "The Chopstir for breaking up frozen ground meat if you forget to get it out of the freezer or if you're just impatient. It's amazing and I love it." —Cassandra C.
24. A nonstick baking mat to use during dough prep and in the oven as a cookie sheet liner. This mat is made of food-grade silicone and can withstand temperatures from –40°F to 480°F (–40°C to 248°C). It has measurement guides along the edges. Get it from Amazon for $11.81. 25. A food processor that'll seriously cut down prep time and allow you to make things like nut butters and hummus from scratch. This processor has an eight-cup capacity. Read our full review of the Cuisinart Elemental food processor for more deets! Get it from Amazon for $67.55+ (available in two sizes and four colors). 26. 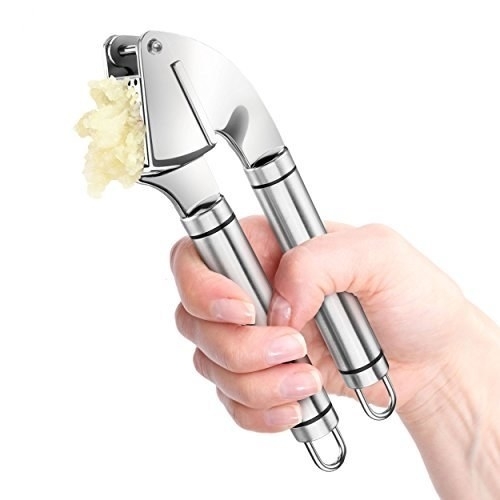 A garlic press and peeler set so you can keep physical contact between your hands and those pungent little cloves to a bare minimum. 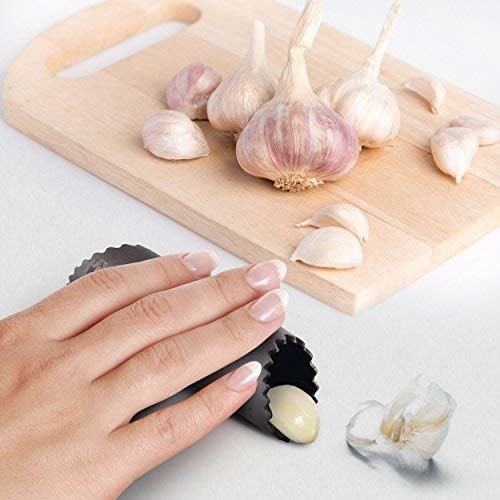 This stainless-steel garlic press works with unpeeled garlic as well! 27. A panini press because hot sandwiches are the perfect food and I would eat one for every meal if I could. The cafe-style floating lid can press a sandwich of any thickness, so feel free to layer up! Get it from Amazon for $34.99+ (available in two sizes). "I don’t know life without a Pizazz. My friends make fun of me, but they still heat up their entire kitchen preheating a stove for one frozen pizza. My pizza is done by the time they put theirs in the oven. So who is the smart one? Plus, it cooks any frozen premade food. Taquitos? Pizazz. Frozen chicken patties? Pizazz. Oh, you want fries with that patty? Pi-freaking-zazz. The moral is: Get a pizazz and change your life." —Evan M.
Get it from Amazon for $43.54. 29. A handheld pot strainer that'll blow a clunky colander out of the water. It's easier to handle, wash, and store. You could say it works pretty ~whale~. 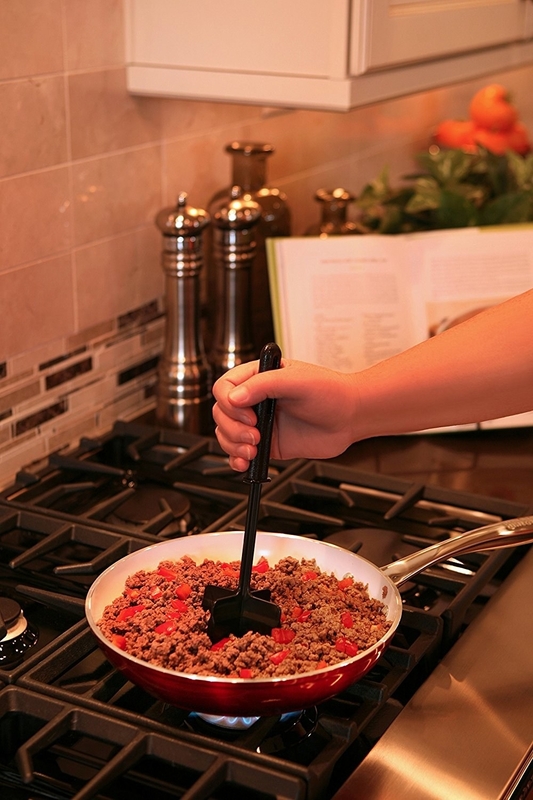 "So much easier and faster than a regular strainer. It's plastic and lightweight, and you just hold it against the side of the pot to strain instead of making the strainer dirty (which is a pain to clean already). One of the best kitchen gadgets I own!" —Amylynn M.
Get it from Amazon for $11.69. Or, check out a non-whale option! Can't get enough kitchen products? Here are some more!